As some sailors know all too well, volume demand for shipboard water at times exceeds its capacity. The traditional approach to alleviate this problem is to change demand, constraining shipboard personnel to endure limited water use. But there’s another way. Engineering a closed-loop water system to re-use water supplies, leveraging mature civilian industry technologies and academia knowledge, could provide a respite for shipboard personnel and equipment. 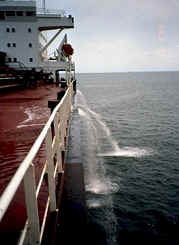 Current shipboard practice is to discharge both black water (sewage) and gray water (non-sewage) overboard while operating beyond 3 miles of land, hold black water within 3 nautical miles while diverting gray water overboard, and while in port collect both black and gray to offload to suitable shore facilities. Instead of diverting gray water overboard, the Navy should treat gray and black water as the two independent systems they are, and close the loop in the sewage-treatment system for reclamation of gray water. This reclaimed water should be used in non-human consumption applications – the water quality to flush a toilet is less stringent than water quality required for drinking water. Recycled, lower quality water can be used as a supplemental cooling medium for refrigerant plants, for topside freshwater wash-downs, bilge cleaning, freshwater ballast tank flushes, and some fire-fighting applications. Additionally, treating gray and black water as independent systems increases sewage-holding capacity by reducing the introduction of gray water into black water. It also lessens the demand on saltwater/freshwater conversion and potable water systems by diverting it to reclaimed lower quality water for suitable applications. Operationally, reclamation of gray water therefore provides an advantage as the Navy supports a more littoral fleet. By extending water use in restricted discharge areas, the Navy enhances its ability to undertake sustained littoral operations. To facilitate the reclamation, the Navy should consider using mature industrial technologies such as biomass reactor vessels and membrane filtration systems on gray water for appropriate applications. Recent national (mostly through the Clean Water Act) and international environmental controls have forced cruise ship and transport industries to improve their sewage discharge, and consequently there has been significant development in both bio and membrane technologies to support reclamation of gray water. The Staff of the Chief of Naval Operations (OPNAV), through its Environmental Protection, Safety and Occupational health Division (N45), has a vision for Environmentally Sound Ships of the 21st Century, whereby new-design ships must be able to operate in U.S, international, and foreign waters in compliance with environmental laws and regulations without degradation of mission or quality-of-life. This means that ships must be designed and operated to minimize waste generation and optimize waste management. With a concentrated focus in re-use of gray water and process improvements in treating the sources of effluent sewage, we can improve the quality of life for sailors, and improve worldwide capability and operability. Lt. j.g. Todd E. Coursey is an Engineering Duty Officer and the project officer aboard USS Porter (DDG 78). Prior tours include USS Ashland (LSD 48) and enlisted tours aboard USS Theodore Roosevelt (CVN 71), USS Dwight D. Eisenhower (CVN 69), and Nuclear Field “A” School in Charleston, SC, where he completed his BS degree and was selected for Officer Candidate School (OCS).